Cardi B breathes new life into this already excellent track. 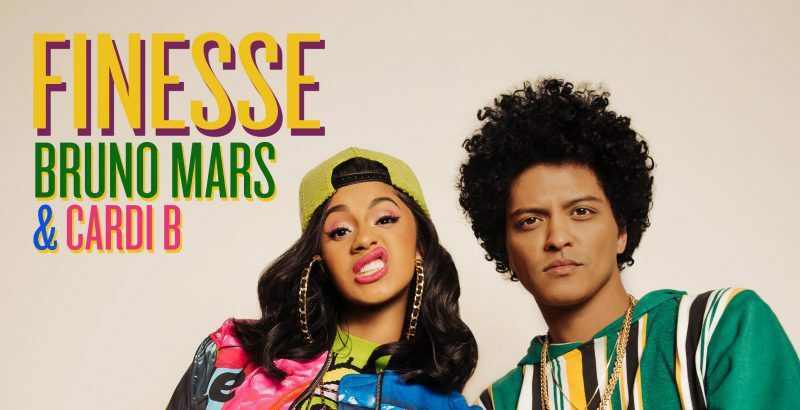 Cardi B’s meteoric rise to rap superstardom is given another boost by this extremely fun remix of the 90’s fused, funky dance hit, ‘Finesse’ by Bruno Mars. The timing of the remix is odd, coming 16 months after the release of 24k Magic, yet there can be no complaints to be had. Cardi B kicks off the track with an inspired 30-second opening verse – simultaneously funny and aggressive – which betrays none of her signature style and verve. The rest of the track is headlined by the smooth crooning of Mars, who continues to flaunt his ability to take you back in time, whether it be to the 70s, 80s, or with this current track, the 90s. The music video is also a fantastically nostalgic throwback to the 90s – full of baggy shirts, colourful jackets, and spotlights, all of which combine to make a vibrant and exciting video. Mars is an excellent dancer and the choreography is flawless whilst Cardi B appears to take great delight from goofing around in a retro getup. The possibility of this track charting extremely well – and it is likely if Cardi B’s first 3 singles are anything to go by – bodes well for Mars, who has an important six months to come. The Grammys are in just a few weeks and with 24k Magic up for Album of the Year, there is every chance we could see a live performance of ‘Finesse’ with Cardi B in assistance.